A flaky, crackly puff pastry crust gets brushed with a roasted garlic-fresh herb olive oil combination (make some extra roasted garlic if you’re making this awesome soup for your Thanksgiving table, and you’ve just saved yourself some work! ), then topped with slices of cooked sweet potato, dollops of creamy ricotta cheese and a sprinkling of fresh chopped sage and chives. Could this tart be any more delicious? Preheat oven to 350 degrees. Cut off the top quarter of the head of garlic so that the cloves are exposed. Drizzle the cloves with 1 tsp olive oil and wrap up in a piece of foil. Set the wrapped garlic directly onto the oven rack and roast in the heated oven for 1 hour. While the garlic is roasting, prep the sweet potato! Peel the potato, rinse and dry it well. Place the potato in a microwave safe dish and drizzle with more olive oil. Cook the sweet potato on high in the microwave for 6 to 8 minutes, until the sweet potato is fork tender. Let the sweet potato cool a bit, and slice into 1/4 inch thick rounds. Set aside. Turn the oven up to 400 degrees. When the garlic is done roasting, squeeze the garlic cloves out of their papers into a medium sized bowl. Add the 1/2 cup of olive oil, along with the basil, parsley, oregano, and salt and pepper. Mash the garlic with a fork and combine with the oil and herbs until well blended. In a long rectangular fluted tart pan (4″x14″) with a removable bottom, cut a piece of parchment paper to fit the bottom of the pan, lay half of the thawed puff pastry sheet in the parchment-lined pan, and overlap it with the second half of puff pastry. Fit the sheets well into the fluted edges of the pan, and press firmly where the pieces overlap in the center of the pan. Cut off any excess dough that overhangs the edges of the pan. Using a fork, dock the bottom of the puff pastry, then let chill until the pastry is firm, about 10 minutes. With a pastry brush, brush the bottom of the chilled puff pastry generously with the roasted garlic-herb oil (save the extra for some wicked garlic bread!). Over the garlic oil, lay the slices of sweet potato. With a spoon, drop small dollops of the ricotta on top of the sweet potatoes, followed by the minced sage and chives. Season with salt and fresh ground pepper to taste, and place on a foil-lined baking sheet. Put the tart on its pan into the 400 degree oven and bake for 35-40 minutes until the crust edge is puffed and golden brown, and the ricotta is starting to brown in places. Let the tart cool slightly, then use a paring knife to loosen the crust edge from the fluted edge of the pan. Lifting up the tart pan, push up the tart from the bottom of the pan so that it comes free from the sides. Loosen the tart from the bottom of the pan, and place on the foil lined sheet pan. Cut into 6 pieces with a sharp knife; serve warm. This tart is the perfect Fall-weather dish to accompany your Thanksgiving meal. 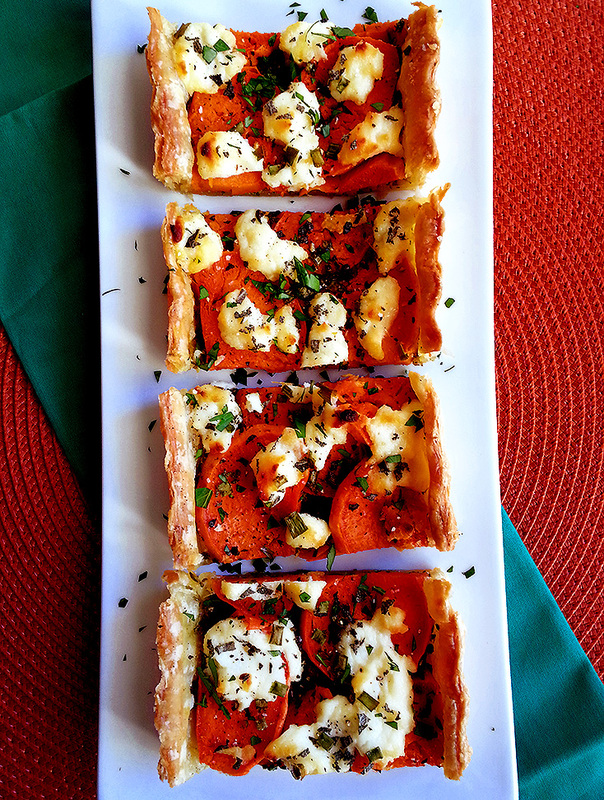 Slice the tart lengthwise and cut it in small squares for an appetizer, or in larger slices as a lighter vegetarian alternative to the usual turkey centerpiece! However you serve it, it’s sure to brighten up your table. Previous Previous post: thanksgiving pie tutorial!